Catherine will tell you many tales of our travels over the years that involved episodes – long, significant, “to the exclusion of all else” episodes – of driving about the countryside looking for open wireless access points so that I could slurp in my email and do other various Internet things for a moment or two. Part of this was a practical need to run a business remotely from a foreign land, but mostly it was a fish-without-oxygen feeling that all geeks get when we’ve been unplugged too long. If you’re a regular traveler, one thing you’ll have noted is that the availability of open wifi is gradually shrinking away to nothing: whereas it was once almost impossible not to find an open access point by walking a few blocks in any direction in any major city, it’s not almost impossible to find any open wifi anywhere. I suspect that this is due to an industry-wide change to send wireless access points out of the factory already closed (whereas they were once sent out open, and you needed to figure out how to close them), and also partially due to paranoia about sharing Internet (i.e. terrorists use your wifi, etc. ), with some of the pressure that might have mitigated either of these relieved by increasingly faster and cheaper cellular network-based wireless Internet. I’m told that in Germany now it’s actually illegal to run your wifi wide open, which means, for example, that cafés and other public places that want to offer free wifi to their customers now have to involve complicated “chit” systems in the equation, and the wifi ain’t so “free” as it once was. I lament the passing of the age of ubiquitous open wifi: sure it was mostly an accident, and only a small portion of open wifi was based on an intentional decision to share on behalf of the owner. But it was perhaps as close as we’re ever going to get to a free and open Internet everywhere. And that was nice. But, fortunately, all sharing is not dead, something I learned last week in Berlin at the Cognitive Cities Conference. On day two of the conference I join some old friends in a scavenger hunt that took us through parts of Mitte, Prenzlauer Berg and Kreuzberg on a quest to answer cleverly-conceived questions that would guide us ever-forward to a finish line. It was fun, the company was good, we ate well, and the weather was nice. But I didn’t plan ahead and found myself without any mobile Internet participating in an activity that was greatly enhanced by the ability to use Google Maps to, say, find the name of a café in Prenzlauer Berg that started with the first two letters of a popular product sold at a nearby flea market (we failed abjectly here: we thought “sch” for “shoes” where it was “bo” for “boots,” and thus we ended up at Café Schwarzsauer when we should have been at Bonanza Coffee Heroes). 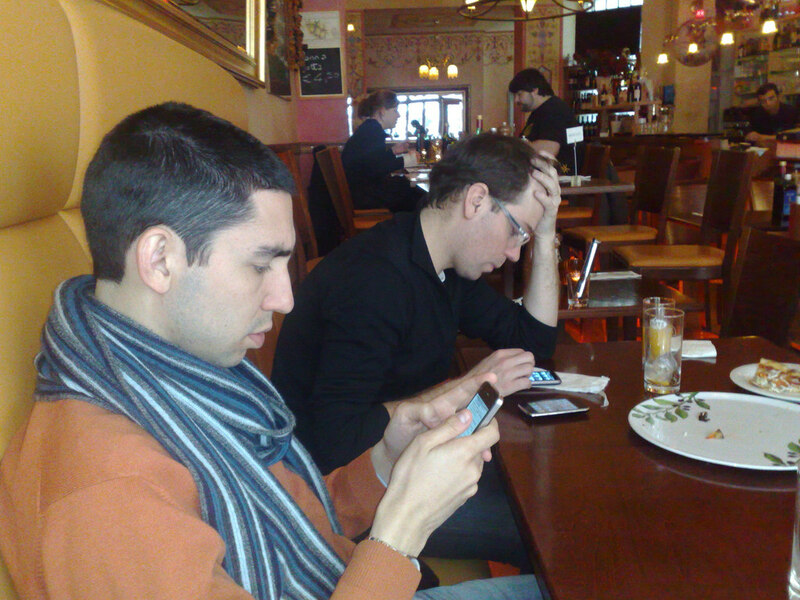 After fiddling around on the fringes of my more-digital-ready colleagues for several challenges, I suddenly remembered that my friend Pedro (that’s him on the right-hand back of the photo, sitting beside our friend João; note how two people are using three devices between them) was carrying an Android-powered phone with a “create a mobile wifi hotspot” capability. So I asked him, sheepishly, if he would mind sharing and he was only too happy to do so. And so all of a sudden the iPod Touch in my pocket, previously starved of wifi oxygen, was back online and I was in the thick of it, ultimately helping guide us to Auguststrasse (“street in Mitte named after a month”). Over the course of the rest of the afternoon I asked Pedro, who switched off the wifi hotspot to save battery and data once I was done, to turn things back on a few more times, to allow for more research or, at one point, to let me top up my prepaid SIM using a web front-end. Pedro is one of the nicest people you’ll ever meet, and so was happy to help a guy out of a jam. But it also felt a little uncomfortably like he was my heroin dealer: he had the stuff that I needed, and he could switch it off at any point, leaving me jonesing for a bandwidth fix. I found the dynamic interesting, and projecting forward it’s fascinating to imagine how this hotspot-conjuring ability begins to acquire a sort of social cachet: being the guy with the hotspot becomes being like the guy who brings the basketball to the outdoor court, or the guy whose parents have cable TV. I also found the experience interesting because it seemed like magic. I know that it’s not magic, and indeed it’s not much more complicated that any of the gizmos that I use everyday. But someone Pedro’s ability to conjure up an Internet from his pocket – out of thin air – was amazing to me, and imbued him with great power and prestige. We ended up losing the scavenger hunt to another team – how exactly we lost I was never sure, as it seemed to me that we did quite well – but it was fun afternoon nonetheless, got me out into the Berlin sunshine with old friends, and turned Pedro into a little but more of a magician than he was before. Written March 9, 2011 at 4:53 p.m.